Niagara Falls from high up above. There is no right way to see Niagara Falls — and there’s no wrong way, either. Whether you’re planning your first trip to see the falls or you’ve visited a few times before, you should consider seeing the falls from a completely new view. All around the Niagara region, tour companies offer fantastic ways of seeing the area by land, sea, and air. Here are some of the best Niagara Falls tours to give you a new perspective of the region. Though Niagara Falls is knowns for its thundering waters, there is much to see on solid ground. 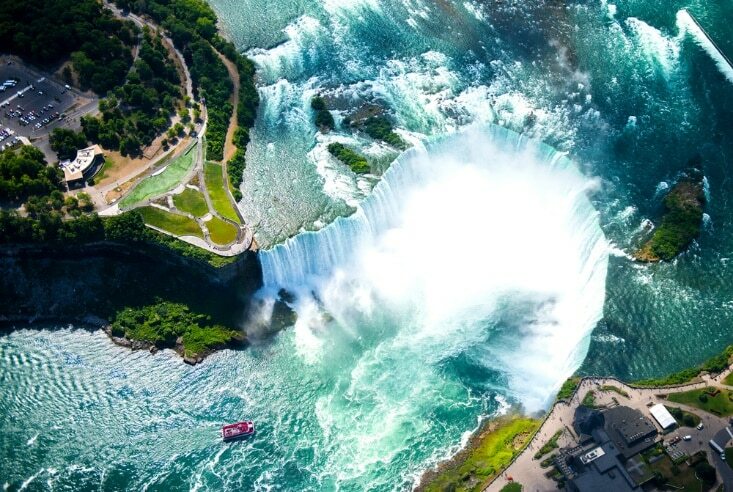 The following Niagara Falls tours will take you in, out, and around terra firma to find the best views and experiences in the area. Journey Behind the Falls. Admittedly, there isn’t a terrible amount of walking involved, as a 150-foot elevator takes you into tunnels deep below Niagara Falls to see the rushing water from behind. You can spend as much time as you’d like watching the water rush past and learning facts about the falls. Historical walking tour. Many groups offer free historical walking tours around important sights in Niagara Falls. Tours usually last an hour and a half, but different guides will provide different information on Niagara’s illustrious past. Fireworks tour. During the summer season, Niagara Falls releases fireworks every weeknight at 10 p.m. Before the show, you can learn a bit about Niagara Falls State Park and the regional landscape as you explore the area at night — with the help of a guide, of course. During spring, summer, and fall, Niagara’s weather is so nice that many visitors enjoy getting around on rented bicycles. Several companies offer bike-borne tours around the region, which help you burn off those vacation calories while enjoying Niagara’s beautiful climate and scenery. Some of the most popular bike tours include trips to Niagara’s famous wineries and vineyards, but there are also tours around Niagara’s small towns and lakes as well as state and national parks. Perhaps the most common choice, bus tours provide comfort and convenience while you see nearly everything Niagara offers. Typically, a bus tour will take up an entire day, and some will keep you busy for two full days, showing you the best sites in Niagara Falls and providing plenty of time for you to take pictures and make memories. Plus, knowledgeable drivers and guides have unprecedented amounts of information about the area, so you get a thorough education on Niagara during your vacation. Like a bus tour but more intimate, car tours limit the party to you, your friends and family, and the driver. These tours tend to cost more than other types of land-based tours thanks to the privacy of the experience, but if you are looking for an exclusive Niagara Falls tour experience, this is likely your best option. You can get a taste for the birds-eye view without taking your feet off the ground by visiting the observation decks of Skylon Tower or taking a turn on the Niagara SkyWheel. Then, if you’re ready for more, you might try getting into the air on the following breathtaking tours. The great Niagara River is much more than the falls. Just north of the falls, there are Class VI rapids and a massive whirlpool that is incredibly dangerous. In fact, the stretch is so deadly that it is off limits to paddlers — the only way to see the whitewater in its full glory is from the air. The Whirlpool Aero Car is suspended from six cables, making it strong and sturdy, allowing you to enjoy watching the swirling, rushing rapids from safety. If the Aero Car isn’t high enough, you can always book a helicopter tour over Niagara Falls. While you might get some bird’s-eye views and panoramas of Niagara Falls from tall buildings like Skylon, being in a helicopter — so much higher up — provides a completely different perspective on the entire region. Helicopter tours tend to highlight the stunning waterfalls and rapids as well as the gorgeous river valley, which is covered in a mixture of rainforest, farmland, and small, quaint townships. The experience is intimate and exclusive — and utterly unique. 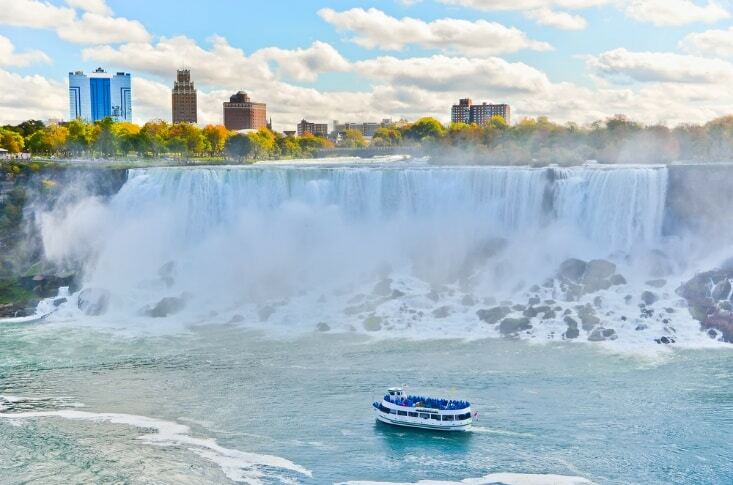 Some of the most common Niagara Falls tours occur on the water — which is hardly surprising, considering that the water is what most visitors come to see. Cruises up the Niagara River are incredibly popular, but two companies stand above the rest in terms of tour quality and comfort. The Maid of the Mist and Hornblower Niagara both take tourists up close to the bottom of the falls, so you can experience the power and majesty of the falls in person. Boat tours occur both day and night — but you should reserve your tickets well in advance, as these tours are extremely popular.